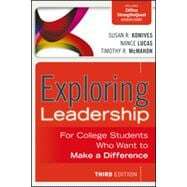 by Komives, Susan R.; Lucas, Nance; McMahon, Timothy R.
This third edition is a thoroughly revised and updated version of the bestselling text for undergraduate leadership courses. This book is designed for college students to understand that they are capable of being effective leaders and guide them in developing their leadership potential. The Relational Leadership Model (RLM) is the major focus in this edition, and it includes stronger connections between the RLM dimensions and related concepts and visual applications of the model. Contains new vignettes that demonstrate how the major concepts and theories can be applied. It also has new chapters on social justice, conflict management, and positive psychology, and new self-assessment and reflection questionnaires. Effectiveness Program at the University of Oregon.